What should you do if you find a nest of Stingless Bees inside a recently-fallen tree? It is very important to check if the nest has broken open at all when the tree fell down. 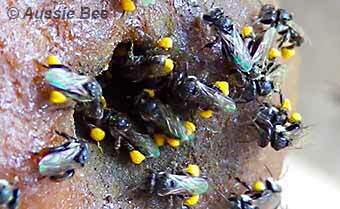 Stingless bees defend their nest against predator insects by sealing up all nest openings, other than the nest entrance, with wax and resin. If these defences have been damaged, the nest may be severely attacked by ants or European Honey Bees. Any cracks or gaps in the timber surrounding the nest, other than the nest entrance, should be sealed up. Good materials to use include masking tape or commercial beeswax. However, other available materials, such as plastic bags or clay, can also be used. If the nest is stable and in a safe location, it can be left where it is. The bees will gradually adapt to the new position of their nest and carry on foraging. Remember that it is illegal to remove nests from National Parks and nature reserves. However, if a nest on private land is in an unsafe location, the whole nest in its original log can be moved into a garden. Nests are best moved in the cool of the evening when flying bees have returned to the nest. The portion of the log containing the nest can be cut out with a chainsaw. Be sure to mark the top of the nest so that you can set it up in the correct orientation in the new location. Cut the tree initially about 60 cm above and below the nest entrance. Determine the position of the top and bottom of the nest by probing the tree cavity with a stick. Then trim the log down until it is just a little longer than the nest length. Cover the nest entrance during transport with some light non-airtight gauze and tape. In its new location, the ends of the log should be sealed with caps of timber or metal to keep out rain and invading insects. If ants are in the area, the nest can be placed on a brick standing in a shallow container of water and detergent until the bees have fully repaired all damage to their nest structure. A nest that is in a badly damaged log can also be transferred into a hive box. Full step-by-step instructions on transferring a nest are available in ANBRC Booklet 9, Boxing and Splitting Hives. 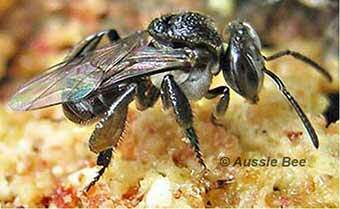 For further advice on setting up a nest or hive in its new location see: Care of your nest of native Stingless Bees. Stingless Bee Nests and Land Clearing. Thousands of Stingless Bee nests are destroyed each year when trees are cleared for land subdivisions. Some Stingless Bee keepers rescue threatened nests and box them to establish apiaries for honey production and pollination. Search for 'Stingless Bee Rescue' on Google to find a service in your area. Stingless Bee Nests Inside Houses. In far northern Australia, some Stingless Bee species nest in urban situations, such as inside wall cavities and flower pots. It is very sad when such nests are destroyed by people who think they are dangerous. Australia's Stingless Bees are quite harmless and make wonderful garden pets. More advice about Bees in Houses. Five Ways to Save Native Bees. Hive Box Designs for Stingless Bees.